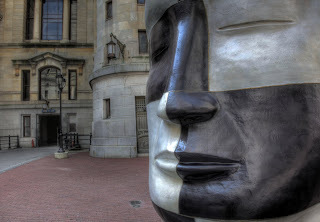 On Saturday night, I caught the last part of a news story relating to the new sculptural installation of 12 foot bronze heads in City Hall courtyard. 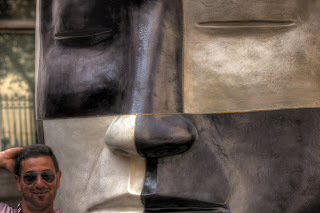 These were so unique, it caught my attention and I just had to go to find out more and thought this was definitely a photographic moment! 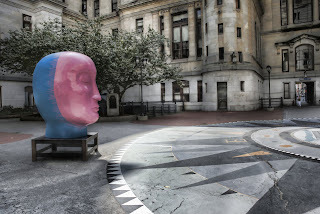 Jun Kaneko is the Japanese artist who created these “dangos” (Japanese word for rounded form) and is being honored with a city-wide celebration of his artwork. 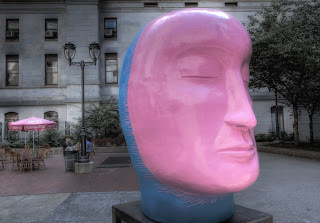 “On the Wings of Music: Art, Opera & You” includes the sculptural installations at City Hall, the Kimmel Center and the Locks Gallery as well as the debut of his production of the opera, Madama Butterfly in October. 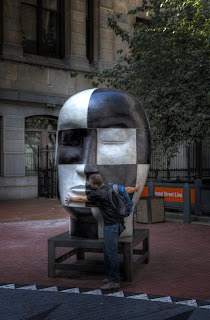 Not only did I enjoy photographing these sculptures, but what was even better was seeing how people interacted with them… some felt the need to connect with a huge bear hug while others actually thought that a photographic moment should include a flirtatious kiss! Move over “Rocky”, your competition is in town! 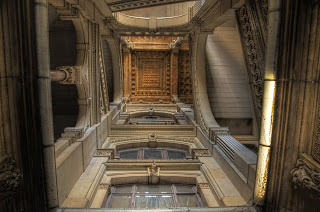 PS…When in City Hall, always look up. The architecture is so intricate and fascinating.